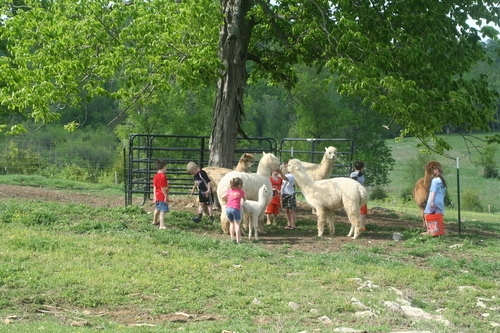 Third Day Farms is an alpaca farm located in Fayetteville, Tennessee owned by Gene and Carol Shreve. We've added Fiber Sorting services! You KNOW you want to do something with all that fiber stored in your barn, basement or spare bedroom! If you have plans for it, Carol can help you increase your profitability! If you have no current plans, she can suggest some! Let us help you get that fiber out of your way and into useful production. Just click on Fiber Sorting under the More Info tab! Our alpacas were a huge hit with our kids' Kindergarten class! Third Day Farms is being shaped by a vision for our home to be a place where families can come together. Although we have chosen the alpaca business as the mainstay for our farm, our dream is to offer a well-rounded experience with something for every member of the family. We plan a picnic gazebo next to the pond where our ducks waddle up to be hand-fed. We have a lovely flock of laying hens to provide fresh, country eggs. We have planted an orchard with apples, plums and nectarines. We have a blueberry patch. And we have planted a large pecan grove with around 80 original stock, paper shell pecan trees. We have many friends who love to come up from the city so they can target practice, so we plan a small, private gun range. We plan at least two other shady picnic areas. We dream of a large covered space up near the barn allowing for groups, bible studies and outdoor music events. As that process unfolds over the next several years, we are quietly building a herd of elite breeding stock alpacas. We are placing emphasis on fineness, density, size and healthy genetic diversity, concentrating mostly on various lines imported during the mid 1990s from the Macusani region of Peru, particularly those from the massive, world-renowned Accoyo breeding program. All of our breeding stock must prove themselves to the highest standards of physical conformation and health. Furthermore, we are a "full service" alpaca farm. Beyond breeding and sales support, we offer boarding for those who wish to invest in alpacas but are not currently in a situation to tend the animals daily themselves. All of our boarders will enjoy full use of our farm as it takes shape for family excursions away from the city. We offer brokerage services in which we will research, locate and negotiate sales on a commission basis. 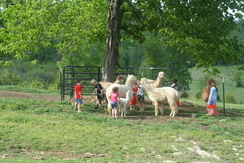 We will train and handle alpacas in regional shows for our boarders and other clients. Gene is an experienced animal trainer and handler. And then there is the luxurious product produced by our elite alpacas--the fleece! We handle alpaca clothing (infant through adult), gift items, yarn, roving and raw fleece for the most discerning customers. Carol loves to knit, although her time is limited, so there are hand-knit and special order items available.